Ever wondered what Michael Fassbender would sound like if he had a West Country accent? The thought of it alone is bizarre, but to actually hear it come out of the mouth of this Oscar-nominated Irish actor, who is slowly becoming one of the most celebrated in the industry, is an experience in and of itself, which is where Trespass Against Us comes in to make that experience a reality – and if nothing else, the film should be remembered solely for this extremely odd notion. The film marks the feature debut of TV director Adam Smith, and tells the story of a family of vagabond criminals in Gloucestershire, headed by the patriarchal Colby (Brendan Gleeson) whose disdain for authority and educational facilities is having a negative effect on the children of Colby’s son, Chad (Fassbender). As a result, Chad is desperate to get away from his father’s influence and ensure that his children are brought up in a less hostile environment, but despite everything he is drawn further into his family’s criminal activities which soon start to catch up to him in ways that he wouldn’t like to imagine. Family is a core theme all throughout the film, with Chad being torn between two very different family ties, both of them on the verge of falling apart. Colby’s hatred for authority is reaching a point where he’s trying to convince everyone that the world is actually flat, while Chad’s kids are falling way behind at school because of their grandfather’s insistence that they take the day off whenever he wants. All the while, Chad himself is struggling with his own feelings of suppression and responsibility due to his family, whether it’s being belittled by his domineering father or irritated by others around him, including Sean Harris as a mentally-ill brother/cousin/family friend (it never really specifies what relation he is to this family), or trying to find a more suitable home for his wife and children than the bomb-site caravan park they currently reside at. The film tries its best to balance its intentions with all the other intense scenes in this movie, but a lot of the time it’s very hit or miss because the script doesn’t seem to have entirely figured out what to do with these themes. When you first see these people interacting, you get the feeling that hostility reigns supreme and that the main character wants and needs something better than this, but then as it goes on the message seems to change to something that more or less says that what they are doing is good so long as family sticks together, which I feel wasn’t exactly the point they were trying to make when it all starts. The script flip-flops between its intentions, ultimately ending somewhere that doesn’t feel satisfying for this particular story, nor is it what they were perhaps trying to convey with earlier scenes that indicated a far different resolution. The performances are good all round, though again it is just bizarre to hear a West Country accent come out of an actor like Michael Fassbender; Brendan Gleeson just about gets away with it, mainly because you get the impression that as an actor, he’s been doing this sort of thing long enough to make that sort of regional accent sound legitimate. Meanwhile, you have an actor like Fassbender who’s an intimidating presence in almost everything he’s in, including this film, but hearing him with Stephen Merchant’s speaking voice almost kills the intensity his performance is creating, because it sounds so ridiculous coming from his mouth. Bless him, he’s really trying here, and when you do take that away it’s still a good performance, but man does that accent take some getting used to, and if you can’t normalise it in your head then buckle up because you’re in for the comedy treat of the month. Overall, I wouldn’t say that Trespass Against Us was a horrible film, more that it’s just wildly mediocre. Despite some good performances (accents aside) and a few scenes that are fairly well paced and suspenseful, including an elaborate night-time robbery of, and subsequent getaway from, a stately manor, the script is a little too unfocused in delivering on its themes and messages, making it a somewhat unsatisfying stab at intense family drama – or comedy, if you’re taking Fassbender’s farmer accent into account. 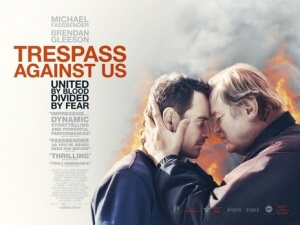 Trespass Against Us contains a fair amount of suspense in select scenes and some fine performances – even though Michael Fassbender’s West Country accent tiptoes around the edge of being unintentionally hilarious – but it’s left a wobbly mess by a script that doesn’t exactly know where to take its themes or its characters to a satisfying conclusion.